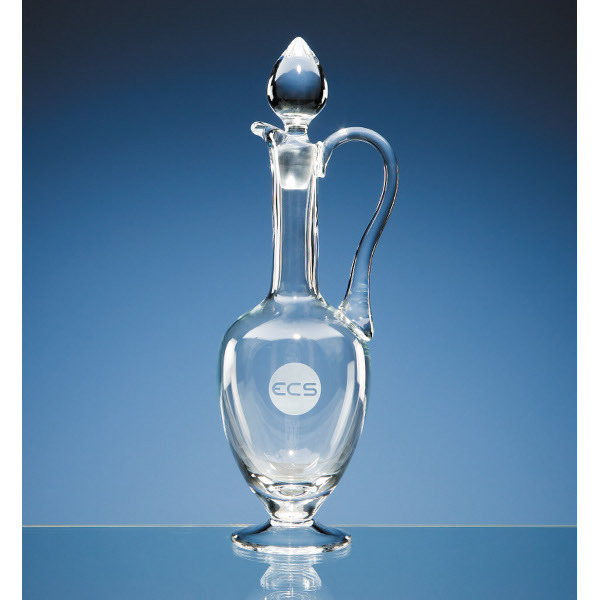 The lead crystal 0.8l claret jug is ideal as a presentation gift or as a sports award. It can be personalised with a logo or wording to create a gift that is sure to take pride of place when put on display at home or at work. The 0.8 ltr handmade footed claret jug includes up to 50 characters engraved for free. Any additional characters to personalise the glass claret jug are then charged at 25p each, and there is also an additional cost for a logo or your own design. The glass claret jug is approximately 13cm wide by 37cm high, and has an engraving area of approximately 6cm by 6.5cm for personalising for your sports event. The postage rate for the glass claret jug is band B.